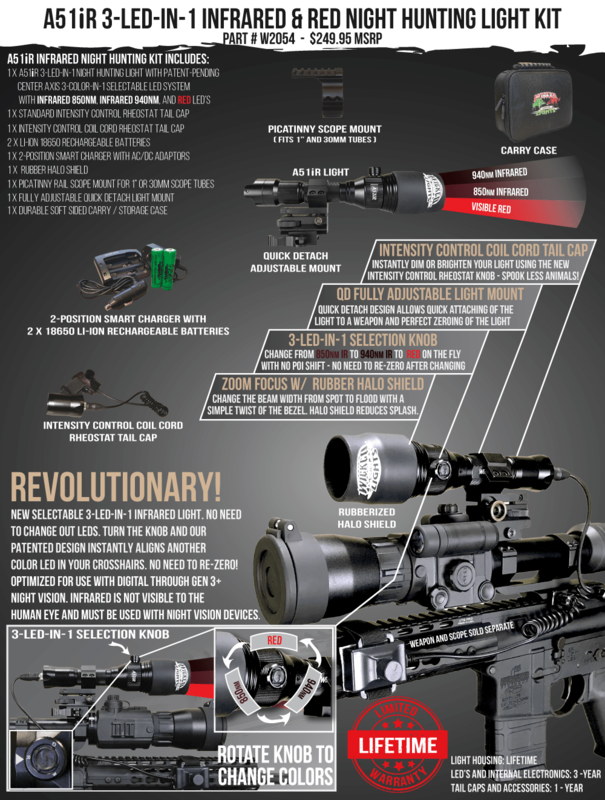 Wicked Hunting Lights is proud to announce the release of the ALL NEW Model A51iR Ambush Hog & Predator hunting light featuring Patented Center Axis Rotational 3-Color-In-1 Selectable Color LED module with LED Position Detent Lock, Zoom/Focus, and Full Intensity Control.The A51iR’s revolutionary patented design is the FIRST EVER purpose built night hunting light to combine all THREE KEY DESIGN FEATURES required in a professional quality dedicated scope mounted shooting light. The first key feature is the revolutionary, Patent Pending 3-in-1 Center Axis Rotational Color LED module with LED Position Detent Lock. In laymen’s terms, you have the ability and convenience to select any of the 3 colors (for example 850nm IR, 940nm IR, or Red) with just a slight twist of a knob and have the LED color of your choice lock in place on the center axis of the light body and in the center axis of the spherical lens. ​Why is the “center axis” so important you may wonder? First, if the LED is not centered in the center axis of the spherical lens, then the light will not reach its maximum potential in light output (as measured in LUX). Depending on how far off axis the LED is, it will also create an artifact or distortion in the light beam which can affect your field of view when looking through a scope. However, the most important reason for center axis select-ability and repeatability is when you mount your light on your scope. With a traditional, single colored led that is centered in the light, you will adjust the windage and elevation so the light is centered in the field of view of the scope (and thus centered on your crosshair). Because one LED is used, and that LED is centered in the light, you can line your crosshair up fairly easy. With a multi colored LED module, you will want each LED centered in your crosshair the moment you change to a different color LED without having to re-zero the light in your scope after each color change. Currently LED color changes are accomplished in one of two ways; (1) physically remove the light bezel and change the LED module or (2) utilize a fixed circuit board with 4 (or more) different colored individual LED’s placed as close as possible on the board that some manufacturers use. Why multiple LED's? You can tailor the light to meet the needs of different scenarios. For example: Use the red LED as a utility light in your vehicle to gather your gear or walk to your stand location. Then you can switch to the 940nm IR LED while scanning a small 150 yard pasture for coyote or fox or hunting over a feeder or bait pile at close range. On the next stand select the 850nm IR LED to scan a large field for hogs rooting or coyotes at long distance. Or maybe you start with a 940nm IR LED but the animal is just a hair out of range, so you switch to 850nm IR to give you that extra range and make the kill. On the contrary, maybe you are using the 850nm IR LED but the particular animal you encounter is exhibiting signs of being light shy to the "glow" so you instantly switch to 940nm IR (so you don't spook the animal) all while maintaining the light output perfectly centered in your scope's field of view. 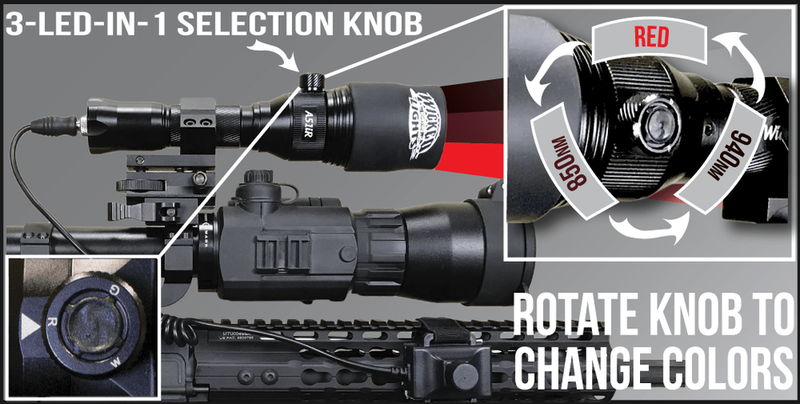 With the A67iR’s patent pending Center Axis Rotational design, there is no need to re-zero the light back into the scope after changing colors. Less time spent fooling around with adjustments means more time spent on target and more animals down. The all new Quick Detach Adjustable Mount allows you to quickly and easily add or remove the light from your scope with the simple flip of a lever. This mount is also completely re-designed to eliminate any unwanted wiggle or wobble. This mount is ROCK SOLID!